LINES, VINES, AND JONAS TIMES: FFE WORLD TOUR PRESALE !! 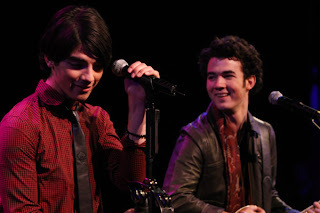 As a member of FFE, you are now able to get EARLY ACCESS to purchase JONAS BROTHERS WORLD TOUR 2009 tickets. Click below to get your tickets now! ** The FanFamily Presale for all other locations will begin on Thursday, 3/26 at 10am local time. PLEASE NOTE: The FanFamily must enter the password POISONIVY on the ticket purchase page. Now you can get up to 6 tickets per guest! It seems like the Jonas Brothers are everywhere these days, and with a summer tour set to kick off in June, they’ll soon be coming to a city near you. But with a 3-D movie out that captures the guys’ last tour on film, what incentive do fans have to come out and check the guys out this time around? The guys will be touring with “American Idol” winner Jordin Sparks and Honor Society, whom the Jonas Brothers said they were “excited” to hit the road with.